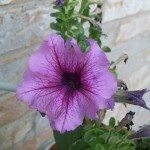 How Do I Tell if a Petunia Bloom is Spent? I know the brown, curled blooms are spent, but I would also like to remove the blooms that are done opening - if they are actually spent. My question is: how do I tell the difference between an old bloom that is still colored but not open, and a new bloom that is about to open? Are the closed blooms in my photo "spent"? It is 2:30 pm mountain time and they have been in full sun since 9am. I do believe the closed dark purple ones look to be spent blossoms. If you look closely you should see the edges appearing drier than say new budding flowers. If you leave them to fall off themselves they usually leave the stamen behind. You can then pinch that part off of the plant. 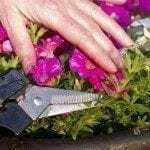 I like to use a small garden snip and trim them back to the next group of flowers. Here is a link about dead heading flowers.